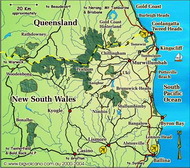 Straddling the Queensland/New South Wales border about 20 kms inland from Point Danger and the twin towns of Tweed Heads and Coolangatta, the European history of the Tomewin region dates from the mid 19th century when the first settlers engaged in timber getting (cedar and rosewood were pre-dominant), cattle grazing and banana growing. 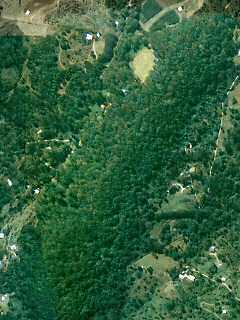 Connecting the Currumbin and Tweed valleys, the steep terrain of the route was a feature of any travel along Tomewin Road. 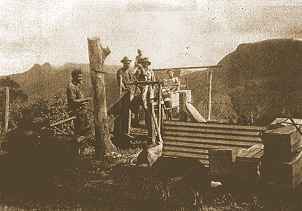 Mount Tomewin has an elevation of 457 metres (1,500 feet) and with most of the ridge at about 335 metres (1,100 feet), logs and other heavy freight needed to be tied down during transport by horse and wagon. 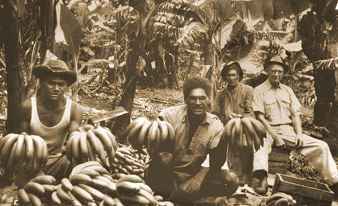 Boom times saw the forced migration of Pacific Islanders (Kanakers) as banana labourers, and their children often made up the majority of pupils at the Tomewin Primary School during its heyday. Present day Tomewin has seen the general demise of farming with only a few holdings of bananas remaining, timber getting being phased out, and the area given over to smaller subdivided lots where hobby farming is practised. 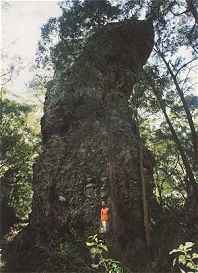 The volcanic history of the area means the soils are fertile with a rainforest canopy of quandong, red cedar, bloodwood and rosewood and a shrub stratum of ferns, bangalow palms, crows nests, elkhorns, staghorns and orchids. High rainfall averages of 2,100 mm (84 inches) per year, contribute to the many springs that are abundant in this environment together with a rich diversity of birdlife and ground animals. Wedge tailed eagles soar and black cockatoos shriek in the heavens; lorikeets and parrots play in the canopy while below, Mr. Carpet Snake goes about his business. Named after a banana pioneer of early 20th century, this lookout on the QLD side of the border provides spectacular views over the Currumbin Valley and Border ranges. It was the site of the banana flying fox of the day when bananas were hauled up the steep mountain slopes for transport to the markets. It looks directly at Mt. Cougal, Boyd's Butte and the sheer walls of Mt. Durran, where the rockface gives off a pale pink hue at sunrise. Springbrook plateau in the background is a cascade of waterfalls during the wet season. In the distance to the east are the sparkling waters of the Pacific Ocean, while in overcast weather, rainforest mists settle in the smaller gullies and around mountain tops not unlike the interior of Borneo and other far flung lands. On the NSW side of the border, the view from this lookout captures the old volcano crater and its remaining core, Mt.Warning, at its best. This view as painted by Gruner was awarded the Wynn prize in 1921. The Tweed Valley floor is littered with sugar cane farms and forest covered foothills with three World Heritage listed rainforests in the area. The tourist centre beside the Tweed River in Murwillumbah gives the visitor an insight into the paradise which lies in this part of the region and has abundant information on the area's attractions. Tomewin on the state border at the top of the mountain, is the half way point for the designated Tourist Drive Circuit joining this part of the Hinterland through Tweed Heads and Coolangatta on the coast. The border fence in "No Man's Land" is still maintained for cattle tick control purposes and allows an easy walk along the border from lower Tomewin past the Hanging Rock edifice (a single monolith relic of the volcanic era) to the Border Gates, a post still manned by the NSW Department of Agriculture. Further west around the border range and accessed by the Garden Of Eden Road, is a one hour walk to Mt. Cougal. The view from the top encompasses the scenic beauty of the old crater and rim that formed from the Mount Warning (Wollumbin) shield volcano. 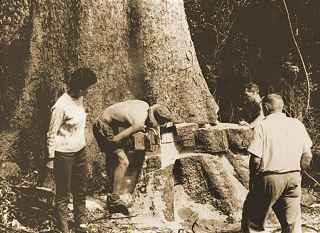 The valley floor on Queensland side is host to the Currumbin Valley Rock Pools, a popular attraction, while at the end of the valley lies the foothills of the Springbrook National Park, which contain rock slides and the remains of an old sawmill built during 1914. At sunrise the forest resounds to the sounds of kookaburras and whipbirds while the sunset over the Cougals with its kaleidoscope of colours may be enjoyed to a background noise of cicadas as you wonder at planet earth's magnificence and this "green behind the gold", all just a stone's throw from Australia's major holiday destination, the Gold Coast. Stayovers are a must to fully explore the local environment as well as a base to sample the delights offered in the region as a whole - a peaceful and natural alternative to the glitter of the Coast whose lights at night beckon in the distance.